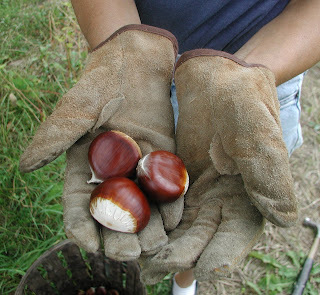 Chestnuts begin to lose moisture usually as soon as they touch ground. They start at about 50% moisture and once moisture drops below 35%, they’re dead and will rot unless eaten quickly or thoroughly dried (for chestnut flour, for instance). 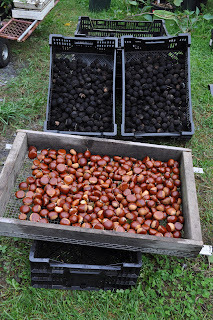 The way to store chestnuts, then, is to make sure they’re plumped up with water, and the way to do this is with a dunk in water for about a week. Soaking also kills weevils. The nuts may begin to ferment, so the flavor is ruined after the dunking -- but they’re not supposed to be eaten yet. 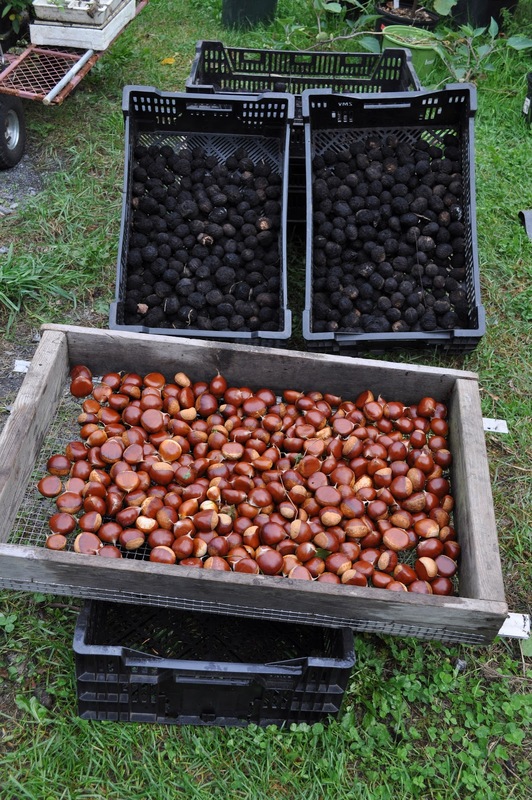 Kept plump with moisture and at temperatures near freezing, nuts subjected to either water treatment will store well until -- since they are alive -- they begin to sprout. Shortening days and cooling temperatures have certain potted plants crying out to be brought indoors. Soon, soon. Subtropical plants, such as bay laurel, rosemary, and fig, tolerate -- even enjoy -- temperatures below freezing, so cold isn’t the threat, for the next few weeks at least. 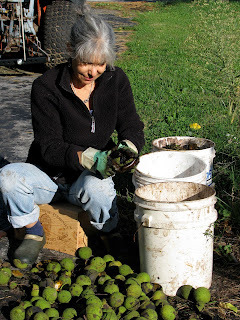 But the later the evergreen plants come indoors, the more chance that I will have fired up the woodstove. The resulting drier air will shock plants if they’ve recently come in from cool, moist outdoor conditions; leaves will yellow and drop. But nobody’s coming indoors yet. First I have to make sure that no creatures are hitchhiking in with the plants. No, not creatures that would threaten me, but creatures that would threaten the plants themselves, and those would be mostly scale insects. 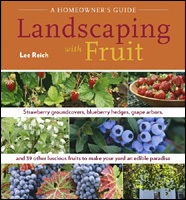 Outdoors, ladybird beetles, parasitic wasps, some fungi, and other natural predators and diseases keep scale populations more or less in check. Indoors, plants are on their own. Scale insects are so named for the waxy covering that protects the adults. They need that protection because once they start sucking plant juices through their straw-like stylets, they settle down in one place for good. Infested plants become weakened and the insects secrete a sticky honeydew that drips on the plant and surrounding furniture and carpet. A dark-colored fungus feeds on this honeydew, blackening leaves and surroundings. Blackening of the leaves, although superficial (the fungus isn’t attacking the plant), further weakens the plant by shading it from light. Scale trivia: Male scale insects die after a couple of days without ever feeding. Some scale species consist only of females. Some scale insects are herded by ants who move them about and protect them from predators; in return ants “milk” the insects for their sweet honeydew. And not all scale insects are bad. Red cochineal dye comes from a scale insect, as does lacquer. 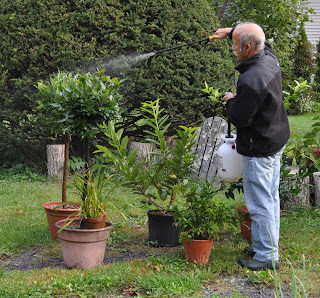 For the past few weeks, once a week, I’ve taken out my arsenal against scale insects. 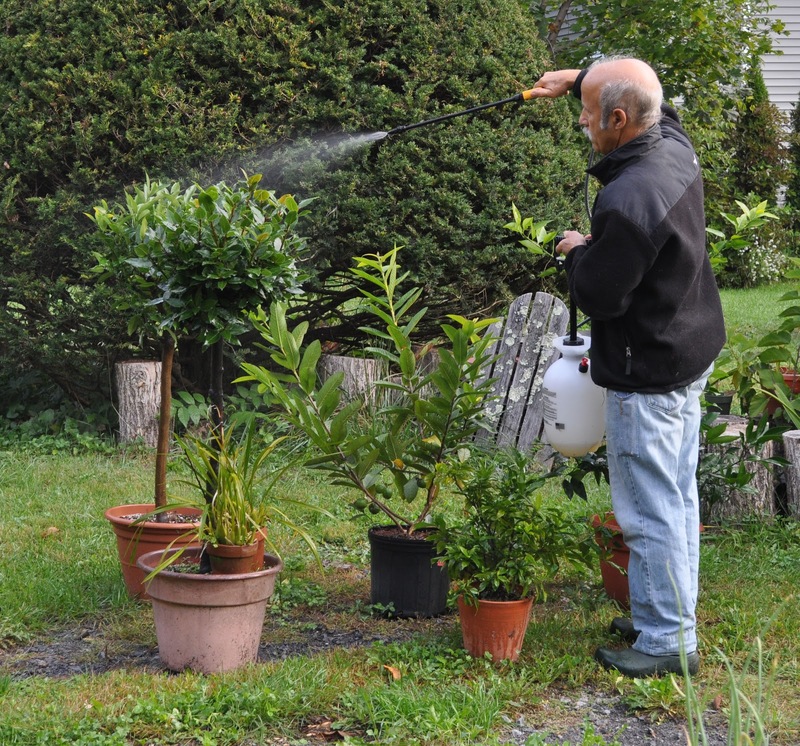 Insecticidal soap is relatively nontoxic and is a kind of soap especially formulated to kill soft-bodied insects. Two teaspoons of mild detergent in a gallon of water is also effective. Repeated applications are needed because the soap is ineffective against scale insects protected by their covering. It’s the little ones, the “crawlers,” as they are called, that I’m gunning for. After birth, they scoot out from beneath their mother’s protective cover to find their own sucking spots, and that’s when they’re most vulnerable to soap. My goal is to keep at it to kill each hatching until there’s no more fecund mothers still giving birth. If the soap merely knocks crawlers off the plant, a subsequent spray will also kill or knock off any that climb back aloft. My last couple of sprays will be oil, which smothers protected mothers and crawlers. (I know this sounds brutal, but experience yourself a houseplant heavily infested with scale and the associated sticky, blackened carpet and furniture before passing judgement.) Oil can damage plants also, especially evergreens, so the oil to use is “horticultural” oil, also known as “summer” oil, which is highly refined to remove harmful ingredients. Like soaps, these oils are relatively nontoxic to nontarget organisms. 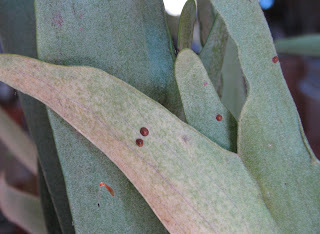 Usually, scale insects hardly make their presence known until just after midwinter. I do notice a couple of scaly bumps on citrus and staghorn fern; these I deal with mano a mano, with a flick of my fingernail. Strawberry guava, though, already has plenty of tufts of white cottony cushion scale on it. The guava also is loaded with ripening fruits so needs all the energy it can get, especially with shortening days. This tropical fruit tastes nothing like strawberry but has a sweet, perfume-y flavor with a nice tang. The reddish flesh and abundant, edible seeds probably give rise to the “strawberry” part of the name. Actually, there’s not much oomph left in the okra and tomatoes. Okra doesn’t bear pods except when temperatures are downright hot. And disease, mostly early blight (not the dreaded late blight of a few years ago) has reduced tomatoes to nothing more than bare stems capped by a few green leaves and fruits. So loss of tomatoes or okra would hardly be noticed except to indicate it was finally time to clear those beds and ready them for next spring. Peppers are another story. The leaves are still green and spry, and cool weather hurries the fruits along on their way to full red ripeness. With cooler and cooler weather descending on the garden, the race is on with cool-weather vegetables -- cauliflower, broccoli, cabbage, turnips, and winter radishes. These vegetables tolerate temperatures well below freezing. But will they do what they have to do, whether it’s making flower buds, heads, or roots, before their growth slows almost to a standstill? Further south, they could wait out winter and finish growing as weather warmed. This far north, they eventually succumb to cold, perhaps headless, flower bud-less, or fat root-less. 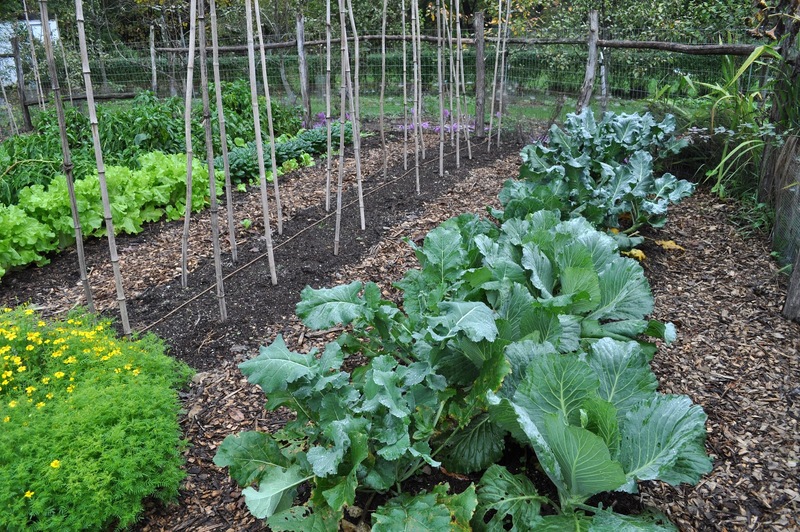 I seeded cauliflower, broccoli, and cabbage in early June and transplanted them a month later. Turnips and winter radish seeds went directly into the ground in early August. According to my records, they should all be on time. 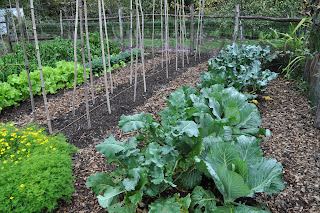 But roots are only just beginning to swell in the ground beneath the turnips and radishes, and there’s no sign yet of flower buds on broccoli and cauliflower or developing heads on cabbage. Which makes me nervous. Kale, of course, is yielding abundantly. It enjoys both warm and cool weather. All it needs to do is keep growing leaves, which it does. No need to leave everything to Mother Nature; I’m going to change the weather. On a very small scale, within my cold frame. For years, I’ve used my cold frame -- essentially a 5 foot by 5 foot wooden box with a hinged, clear top sloping southward -- to extend the season for fresh salad fixings. This year it has become a hotbed, which is a cold frame with warmed soil. 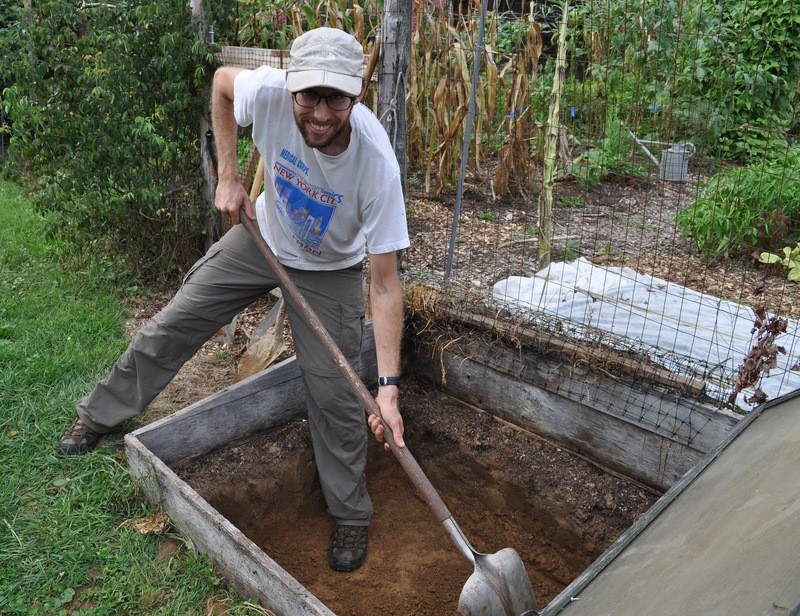 Soil can be warmed in a number of ways. 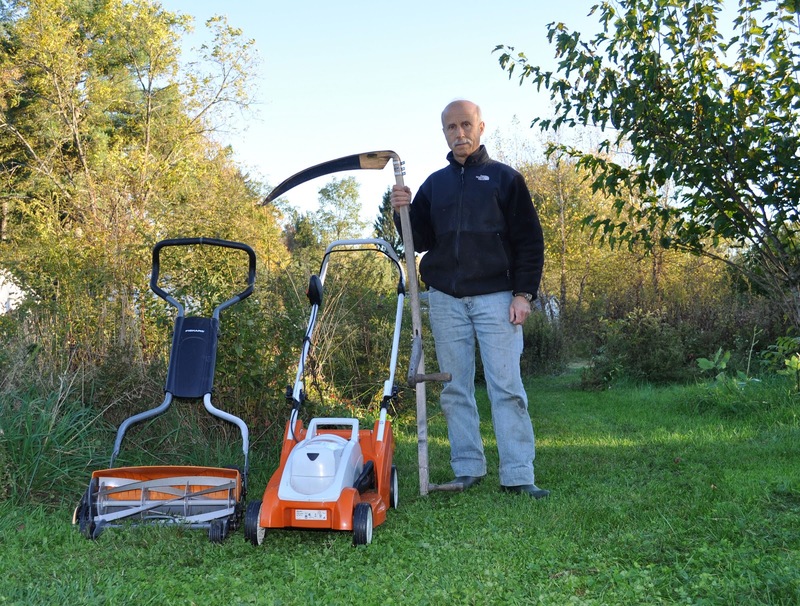 Most modern is with an electric soil heating cable made for this purpose and woven back and forth beneath the ground. Most old-fashioned -- and the method I’m using -- is with manure, utilizing the heat of its fermentation. 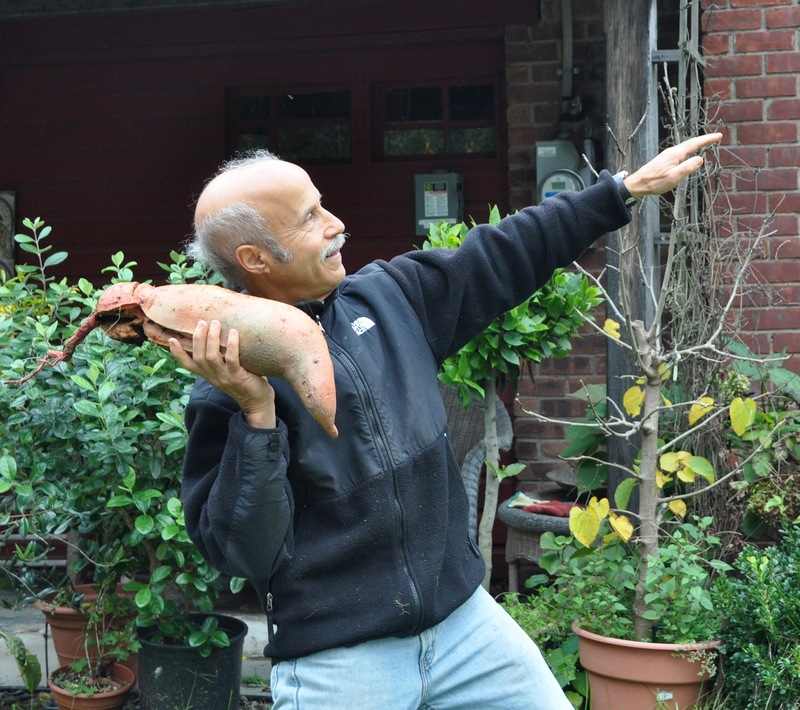 Successfully growing plants in a manure-heated hotbed demands a mix of art and science. Too much heat, too fast is to be avoided as is, of course, too little heat. To start, I and my able assistant David dug almost 2 feet of soil out of the cold frame. 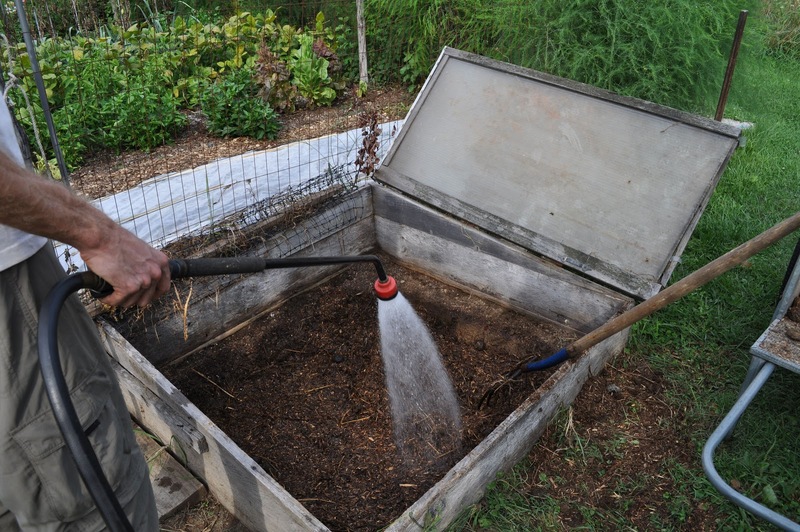 I had on hand horse manure mixed with wood shavings and a little straw; the mix was fairly fresh and moist. 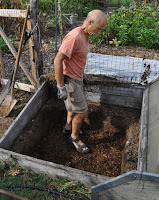 As David forked the manure mix into the bed, I watered it and occasionally got right into the frame and stomped it down -- not too hard, which would drive out all the air, but enough to pack everything together for a critical mass to start heating. Once the bed was filled, the mix was topped with a 4 inch layer of ripe compost. 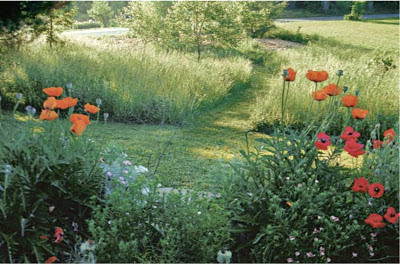 Those few inches are needed to keep young, tender roots above the hot layer which, as it eventually cools, can increasingly accommodate roots. A few days later I scratched out furrows into which I sprinkled lettuce, spinach, and arugula seeds. Spinach usually survives winter here in a cold frame. 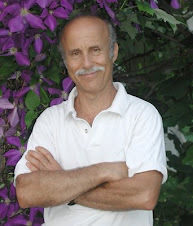 Lettuce and arugula do not, so will provide a good measure, along with speed of growth, of the efficacy of the heating. One week after planting, temperatures about a foot down into the bed are around 80°F. I’m lucky in not having to leave things to Mother Nature even if the hotbed’s performance proves less than stellar. A few steps away is my greenhouse, now sprouting a panoply of cool weather greens, as well as ripening cucumbers and figs.